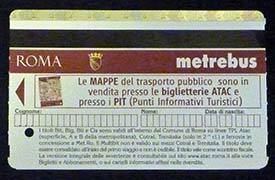 How to buy (and use) tickets for Rome's Metro, buses, streetcars, and local commuter trains. 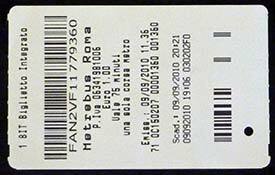 ABOVE: The front side of a "Metrebus" ticket, which can be used on Rome's Metro, public buses, streetcars, and some suburban or regional commuter trains. Rome Metropolitana trains, buses, and trams use "Metrebus" tickets, which are valid on all three modes of transportation. The tickets can also be used for commuter-train rides within the Comune di Roma (including the beach at Lido di Ostia but not Fiumicino Airport). Unless you're riding the Metro (where you can buy a ticket in the station), you should purchase a supply of Metrebus tickets ahead of time, since you'll need to have a ticket before you board a public bus or streetcar. BIT is the standard ticket for one Metro ride (with train changes, if necessary), one commuter-train ride, or 100 minutes on public buses. It costs €1,50. Roma 24H is a 1-day ticket. It's valid for 24 hours of unlimited travel on the Metrebus network. The price is €7. Roma 48H is a 2-day ticket. It's valid for 48 hours from the time you first use it. The price is €12,50. Roma 72H is a 3-day or 72-hour ticket. The price is €18. CIS is a a 7-day ticket. It's valid for one week from the time of stamping. The price is €24. Another option is the Roma Pass, a transportation and museum card for tourists. (See below.) It works a little differently than the Metrebus tickets, but you can use it on the Metro, ATAC buses, trams, and specified commuter-train lines. When riding the Metro, insert your ticket in the slot on the front of the turnstile, and retrieve it from the top of the machine before going through the gates. When riding a commuter train, stamp your ticket in the yellow machine on the platform before you get on the train. When traveling with a 1-, 3-, or 7-day tourist ticket on a bus, tram, or commuter train, stamp it only once (the first time you use it) but keep it with you in case an inspector demands to see it. When traveling with a Roma Pass or other RFID (radio frequency identification) card, hold the card next to the yellow sensor on the bus, tram, or Metr turnstile until the green light flashes. The Roma Pass may be worth investigating, depending on your Rome vacation plans. It comes in two versions: the original three-day Roma Pass, and a cheaper Roma Pass 48 hours. Both allow unlimited travel on Metro trains, city buses, trams, and a handful of commuter trains. Each pass also allows free or reduced entry to selected museums and archaeological sites, with a priority "skip the line" turnstile at the Colosseum. ATAC, Rome's municipal transit network, has public-transport maps and other information in Italian and English on its Web site.